The volleyball program at Lakeside Lutheran High School recently held its sixth annual Dig Pink® event to raise funds for breast cancer awareness and research. Through a night of special activities and an online donation page, the program raised over $3,700 that will be given to the Side-Out Foundation, Inc. for breast cancer research and patient support. Hundreds of spectators from both Lakeside and Luther Prep showed up to cheer on the Warriors and Phoenix as they battled in pink on the court. The stands were filled with fans wearing pink clothing, and activities including a bake sale, raffles, chuck-a-duck and recognition of participating elementary volleyball teams were conducted before and during the matches. 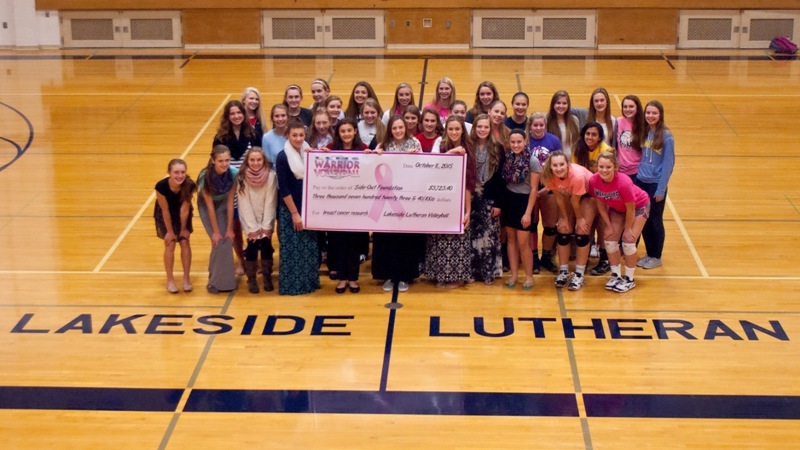 Members of the Lakeside Lutheran freshman, JV and varsity volleyball teams stand behind a check representing the over $3,700 raised for breast cancer research during the 6th annual Dig Pink event held at Lakeside Lutheran. The proceeds from all donations benefit The Side-Out Foundation, a national 501(c)3 non-profit organization located in the Washington, D.C. area. Funds are currently devoted to cutting edge targeted therapies and molecular profiling. Side-Out also devotes a portion of the funds to local and national cancer support organizations. Lakeside Lutheran joined thousands of teams from around the country who participated in the Dig Pink® National Breast Cancer Awareness Rally in the 2015 season.